Bat Cave #2. That’s the first thing you can easily make out about the main farm building at West Philly’s nonprofit Mill Creek Farm. It’s painted in yellow on a piece of metal that juts out of a low, glimmering building in the middle of a green plot at 49th and Brown. Though no bats yet live in the cave—actually a small structure meant to mimic the attics the nocturnal animals prefer—the attempt to attract them is just one example of the creativity and ingenuity on display at Mill Creek. “We want them because they eat mosquitoes,” says Johanna Rosen, one of the two women who run Mill Creek. Their choice to attract bats instead of spraying chemicals is one of Mill Creek’s goals: to grow healthy, fresh and chemical-free food to support their community. To help fix that, Mill Creek offers produce for sale at the farm on Saturdays from 11 a.m.-2 p.m. and on Thursdays at the bus stop on 52nd and Haverford from 1 p.m.-5 p.m., donates food twice a week to community food shelters and sells produce at the Mariposa Food Co-Op on Baltimore Ave. They start the produce stands in late June to get their food sales to coincide with a state payment—an extra 20 dollars as part of food stamps—to purchase local food. Despite their small size—their plot is about half as long as the block and as wide as a few rowhomes—Mill Creek produces a variety of veggies. Leeks, spinach, collards, carrots, beets, cilantro, dill, cucumbers, lettuce, chard, kale, tomatoes, potatoes, peppers, okra, sweet potatoes, asparagus, strawberries, beans, sunflowers, turnips and mustard greens all pop out of the soil. They were already harvesting asparagus in early May and getting local favorites planted. So they started Mill Creek to both teach people about growing food in an urban setting and how to do it as sustainably as possible. Almost everything used at the farm comes from the land, or salvage. The main building itself is made using “cob,” a construction method that uses dirt, sand, straw, water and other objects (in their case bottles, bike parts and tiles) to make an adobe-like structure. Rosen and Walker showed me around the farm and the many improvements they’ve worked on since getting access to the land as part of a Water Department project to decrease water runoff into the sewer system. If everything looks handmade, that’s because it usually is. The farm was a vacant lot before, “just trash and weeds,” according to Rosen, but now it sparkles with life. A mural inside the building is made from tiles plucked from a dumpster and some mirrors a friend didn’t need. The pastiche of colorful tile pieces and mirror shards are reminiscent of the stuff local artist Isaiah Zagar has covered the South Street area with, but it depicts the silhouettes of the six high school students who helped build the farm from nothing in 2006. Mill Creek is also trying to make sure the green space they’ve carved out of the urban landscape remains preserved. Presently, the land is owned by the Redevelopment Authority, a department of the city that manages city-owned property. The Water Department manages the Mill Creek plot and leases it to Rosen and Walker as a stormwater retention project. While it succeeds at reducing stormwater runoff—thanks to the absorbant soil, water-hungry plants and a berm installed by the Water Department—Mill Creek is much more, and the farmers of Mill Creek don’t want to lose it. They’re trying to get the space donated to a land trust run by the Neighborhood Garden Association that would guarantee it remains green space. 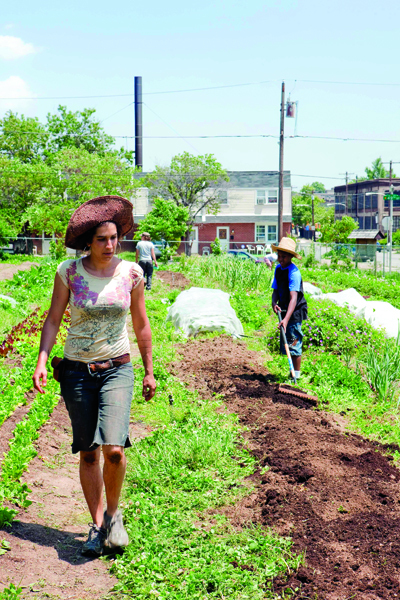 “It’s really important to protect the farm and the community garden as open space for growing food and education and these continued environmental benefits for the neighborhood,” says Rosen. The only hurdle remaining is approval from City Councilwoman Jannie Blackwell, who represents this section of West Philly. All of the other city authorities have agreed to the deal, so the two women have been circulating a petition, and urge people to contact Blackwell on their website. Regardless of how long it takes to get the land set aside, Walker and Rosen are committed to continuing their work at Mill Creek.